Data Binding is the process to build a connection between the user interface of application and business logic. And Dependency Injection means when one object is having dependency over another object or else one project supplies the dependency of another object. Most of the websites built today are difficult to understand as they don’t have much clarity in it. We need to create more CSS classes to express the intention of each object in the DOM (Data Object Model). With AngularJS, things have become easy to understand and work with. 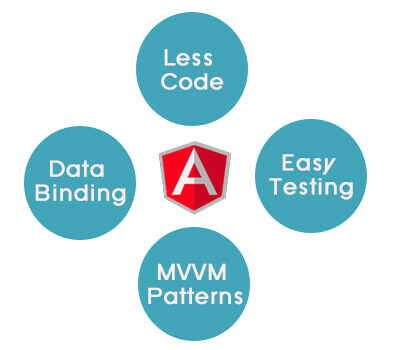 AngularJS works with HTML and XML for endless possibilities. As AngularJS is easy to understand and plus it uses the basic HTML as its template language, it becomes more easier to use and execute too. It also makes use of its own written custom code called directives like ng-directives, MD-directives. As AngularJS application doesn’t need any type of additional framework or plugins, it even includes testing. One can easily test the app with all built-in features of AngularJS. Because it has one of the strongest back end development facility. It is an open source framework, which allows you to develop the UI as per customer’s need and also the single page applications. If you are looking forward to hiring dedicated developer team then Coruscate is the perfect answer to it. And even you don’t know anything about AngularJS then no need to worry. Our team at Coruscate has every answer to it. For an example, the clients for whom we have developed the web application or mobile application, are all from different fields. Here is the list of the clients for whom we have developed the app. This client is into Bakery Business and fine-dine as well. It’s an entrepreneurial organization, which is a global peer-to-peer network. AngularJS is very easy for angular developers, it requires very less code to write for applications development and it doesn’t ask for the separate code for Model View Controller at the same time it can be efficiently used for developing single page applications. With AngularJS the testing part has got easy. And the application uses Dependency Injection to bind the entire application together. It modifies and manipulates the DOM to update the data and the behavior. And with the use of AngularJS, data manipulation’s tasks have now become of the directives and not views. The PubSub system in Angular has been it specific that the broadcast () will send messages to all the children controller. Directives are different element set which can be used anywhere other than your web application. To make your own webstie or mobile application in angular JS people highly recommend Us. Coruscate is one of the best angularjs development services providing company, our expert web developer team member or project management will get in touch with you to understand your requirement and to figure out the right solution for the same.